Feel cool, calm, and collected in the Classic Surf Dress. Designed with a cold shoulder and adjustable straps. A Classic must have. 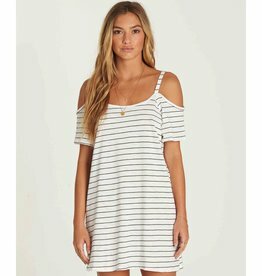 Stay salty after the sun goes down in this versatile beach to street tunic. A crochet back and dropped arm holes let your swim shinethrough, day or night. Gauze tunic dress / beach cover-up. Sleeveless with dropped arm holes. You need this unique cover up in your wardrobe now! This ultra versatile style can be worn as a wrap dress or open like a kimono. Grab it before it's gone! This easy to wear cover up is all your swim wardrobe needs! The white will match with any suit, and the flowy fit is ideal for any body shape.